For those viewers who regularly traverse the desert of family entertainment, Disney’s The Princess and the Frog feels like a cool drink of water. Ten years have passed since Tarzan, Disney’s last great hand-drawn musical (I’m pretending that 2004’s Home on the Range didn’t happen), and it warms my heart to see traditional animation back on the big screen. The Princess and the Frog isn’t loud, isn’t 3-D, and doesn’t resort to bodily humor. It isn’t perfect, either, but it gets the big stuff right and works as a fun reintroduction to the sort of classic entertainment that Walt Disney Studios has always done best. The film opens with a new Disney logo, featuring a short clip of Mickey Mouse from Steamboat Willie (1928); this logo will apparently denote all of Disney’s hand-drawn features from now on. The film follows Tiana, a beautiful, spunky, African-American woman living in New Orleans in the 1920’s. She dreams of opening her own restaurant, but even after years of saving, Tiana still needs a bit more money. Enter Prince Naveen, a free-spirited royal who claims to be wealthy but is actually hard up for cash. Naveen falls under the dark magic of Dr. Facilier, an evil witch doctor who turns Naveen into a frog. 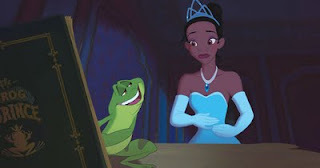 As a frog, Naveen convinces Tiana to kiss him, but far from breaking the spell, Tiana’s kiss turns her into a frog as well. The two then set off into the bayou to find the solution to their amphibious dilemma. 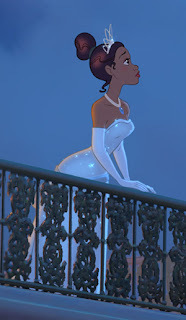 Pixar has done a remarkable job of keeping the Disney magic alive over the last few years, but The Princess and the Frog reminded me of why hand-drawn animation is so valuable. Traditional animation brings a type of humor that doesn’t exist in any other format; nearly every frame has some zany slapstick element. Characters fall down, bounce around, soar across the screen after taking punches, and it’s charming. There’s a special tone and pace that no other format can replicate. Tiana makes a wonderful Disney Princess. The film never goes all the way in exploring the real difficulties of being an African-American woman in the 20’s, but if it did, it wouldn’t be a family film, now would it? Tiana is a respectable, independent woman who believes in wishful dreaming but believes even more in hard work. She’s a Disney Princess for our times, and the film’s Great Depression setting will fit modern audiences like a glove. The side characters remain humorous and lovable, fulfilling yet another Disney requirement. Randy Newman’s musical numbers work well enough, but they aren’t particularly memorable. Had I been given the task of reviving Disney’s animated musical tradition, I would have handed the project to Alan Menken, the master composer behind such classics as The Little Mermaid, Beauty and the Beast, and Aladdin. Menken will provide music for next year’s Rapunzel, which will apparently be a musical marriage of CGI and traditional techniques, but I would have loved for his music to have been at the heart of all of this. Still, Randy Newman’s songs get the job done and carry a jazzy flair that not only marks new territory for Disney but perfectly fits the New Orleans setting. The movie stays light-hearted and humorous with only a few exceptions. Disney boasts a long line of great villains, and while Dr. Facilier isn’t great by any means, he is sufficiently creepy. Disney has frightened children since Snow White (“Bring me her heart”), and Dr. Facilier’s voodoo antics may scare some younger viewers. Also, the death of one beloved character feels wildly out of place, because the tone of the picture doesn’t pave the way for it. Still, these scenes are brief exceptions to the rule. I went to a late-night showing which meant there weren’t many people in attendance (too late for the kiddos, and all), but the few of us who were there applauded at the film’s end. With The Princess and the Frog, Disney returns to its roots in admirable fashion, proving that the inkwells of old have not run dry. Through good characters, a fun story, lovable sidekicks, and an energetic, inventive presentation, Disney’s filmmakers blew the dust off of Walt’s old recipe, and the finished product tastes as sweet as ever. I think kids will love The Princess and the Frog. The characters are captivating, and the fast-paced adventure will hold everyone’s attention. Dr. Facilier does conjure evil spirits to do his bidding, which are essentially creepy-looking shadows. Kids may be frightened at times, but the film’s other virtues far outweigh the scares. "featuring a short clip of Mickey Mouse from Steamboat Willie"
So, is Disney trying to say they've come full circle here? I mean, mixing their first black princess with Steamboat Willie, that's a statement if you ask me.